Bray Wyatt To Debut New Gimmick In WWE? "Today I have finally become who I really am." Don't get too excited, because we've rode this particularly see-saw many times before, but it looks like Bray Wyatt may just be about to debut a new gimmick. Or, at the very least, return to the roots of his old one. Eyebrow raising, huh? The implications seem to be crystal clear: next time we see ol' Bray, he'll be unrecognisable - or, perhaps, painfully recognisable. 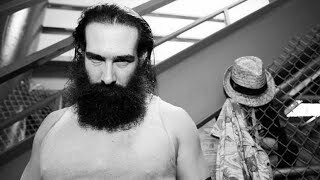 Wyatt has been completely missing from our screens ever since tag partner Matt Hardy announced his indefinite leave of absence in September - though he did make a surprise appearance as part of the untelevised portion of WWE's Starrcade last month, filling in for the injured Braun Strowman against Baron Corbin. Though by all accounts perfectly fit and healthy himself, it seems WWE has been using Hardy's sabbatical to allow Bray chance to rehabilitate his broken character. Lord knows if any of the company's superstars needs to hit the reset button, it's him. Obviously the best thing that can happen is for Bray to return as an evil inland revenue clerk, following in the family footsteps. He won't, and given that his sole Tweet was cryptically cult-like, we're guessing who Wyatt "really" is will be a hard reboot of his original gimmick. Can't wait.